I have been designing a new printable extruder. It is primarily intended to be small and light enough to mount directly on Huxley, but it should work on virtually any RepRap or similar 3D printer. 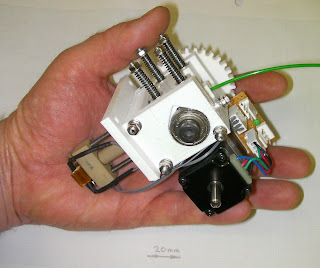 RepRap Universal Mini Extruder from Adrian Bowyer on Vimeo. Do you have room to get the springs inside the extruder body? I always wanted to use wingnuts to stop them turning and a round channel inside the plastic body as a guide for the springs and somewhere for them to compress. Then you can have nice and tidy wingnuts on the other end to easily tighten it up and it also makes it much easier to take apart to clean. Any plans towards Herringbone gears on the 'official'Repraps? Have you tried this in a Bowden configuration? is the NEMA11 strong enough? It may be possible to recess them into the body (and also to use shorter springs - those were just the ones I had...). But I don't want to make too many holes in the part that holds the squeeze bearing as that needs to take the compression force. I haven't tried this as a Bowden driver, but I would expect it to work. Nice! I haven't even gotten my "Adrian's Extruder" going yet and there is already a new one. Have you ever considered building an extruder with two hot ends driven by a single motor? You would need some kind of clutch to switch between the two (build and support material or two colors). I only ask because it seems that, with it's small size, this could be a good starting point for such a project. Or perhaps it would just be too difficult to prevent backlash when shifting gears? dissidence - hope things pick up. This design was the last major hurdle to my version of Huxley. I should be testing that next week, and documenting it thereafter. Kevin - with 1.75mm filament there is the realistic possibility of driving several filaments off the same shaft - you just lift the roller bearing off a filament to stop it moving. The whole thing would probably be bulky, but the lifting mechanism could be a set of cams driven by a single DC motor with a slotted encoder. I can't see why it wouldn't work. Of course, the stepper would be always driving only one filament, so there should be no torque problems. Just looking at the motor choice, and the motor youlink to is the 6 wire model with 900g/cm. Your picture shows a 4 wire model, did you mean to link to the 1200g/cm 4 wire version?